A new chapter in our lives began today as we watched Will climb on to the school bus to go to full day Kindergarten. With a big smile and his huge backpack Jack guided him to a seat. At school Will was escorted from the bus to his class line by a bunch of the neighborhood friends, mostly boys Jack’s age. Jack, Kadin, Willy and Griffin excitedly came up to Will and gave him high fives as they walked across the blacktop. Will is like their little brother too, since they are either only children or the youngest. Talia tightly held Will’s hand as she navigated her way to her 1st grade line, which is right next to Will’s Kindergarten line. Talia spotted me as they were walking and turned to say that she would make sure he got to his line every day since she was right next to him. How fun for her to be the bigger kid at school this year and watch after Will. I couldn’t stop the tears of happiness for Will and all the kids that are so excited that he is finally at school. For those who still wonder why we live where we do and put up with some grey days throughout the fall and winter…well, now you know. This is home. And friends like this are what make it home. I am excited and happy for Will in this new chapter of his life. He is ready for this step. I am anxious and nervous about what the classroom will be like for him with his vision. 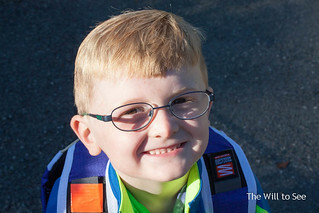 He is the first visually-impaired child at our school (Creekside Elementary is only five years old), and it is new to some of the staff. I am sad because he is my baby and growing up. I am lonely. For the first time in almost ten years I will spend most of my day by myself. Will has been my buddy, running errands, going to the gym, having lunches and daytime play dates. The house will probably seem very quiet for the next few weeks. I am going to cherish the next two years, because these are the only years where both boys will be at the same school. He only looked for me once as he stood in line and in the classroom that was filled with parents. I blew him a kiss and headed out the door. Today is a milestone for our family, a time full of many emotions, a bunch of change and lots of hopes.